For the uncontrived and unalloyed delights of Roger Davidson’s writing, Live at Caffé Vivaldi –Volume 1 is a recital of a rare questing elegance. While our ears have become accustomed, in the course of the long career of pianist Roger Davidson (and bassist Pablo Aslan, I might add), to an even greater degree of the period of Latin sensibility in Mr. Davidson, there are some musicians for whom a lived-in journey of experience provides a fast track to the heart of these emotion-laden works. The matter of artisan’s tools here becomes considerably more than a curiosity, even if one is distinctly aware that the piano and especially the bass encourage distinctive timbral reflexes, such as consistency of colour rather than the variety of intonation of each genre of instruments. Perhaps this music will appear a little unfamiliar to younger listeners, since both Mr. Davidson and Mr. Aslan are no observant mannerists and at times even anti-stylist. Certainly, while the music here is deeply emotional there is not a drip of sentimentality. In fact, the music of Roger Davidson, in all its diversity and passion appears to have an unstoppable momentum in the symbiotic and dancing relationship that the composer enjoys with his rather familiar musical cohort, Pablo Aslan. 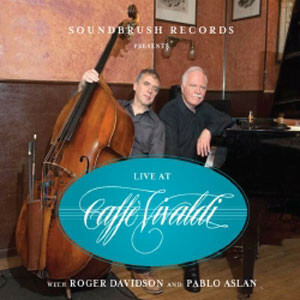 This highly entertaining and gripping recording, crisply executed by Mr. Davidson and Mr. Aslan has an energy, drive and polish entirely apt for the compelling adventure that takes place at Caffé Vivaldi. Its brilliant orchestration is echoed in the simpler yet evocative tangos and waltzes, pieces that echo highly popular times in the Latin America of an era gone by. Although this is not a sign that they are old fashioned, there is something rather moving about the black-and-white hue of these arrangements and the era which inspired them. The playing is especially brilliant throughout, but here more poignant in the pizzicato and splendid con arco playing of Mr. Aslan when Mr. Davidson comps behind him. In “Adiós Dolor” and “Landini’s Waltz” for instance, that kind of playing falls most happily into that rich, optimistic vein of music for piano and bass, for which it is so well endowed. 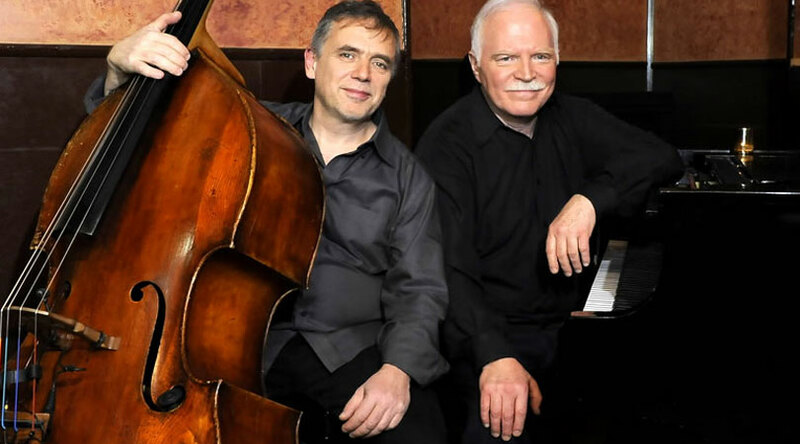 Its rhythmical character, which is played here with a dynamic precision, and sweeping dimension for duo has an attractive modern edge redolent of Astor Piazzolla’s tangos especially in the outer movements. This can also be said of the later pieces, the splendidly colourful “Amantes para Siempre” and “Two Hearts in One” which appear to be rather like little sinfoniettas in their fuller orchestration. The judicious loops in and out of the dialogue of piano and bass take a patrician distance in the profoundly moving “Anónimo Veneziano” and this is almost unbearably poignant, while encouraging the robust bassist to muscle in on the action especially in the finale of the piece. The ubiquitous standards are stripped of their formulaic signposts: the curvature of Mr. Davidson’s original compositions has never sounded so effortless—and yet he identifies only with what pleases him in the gestural world of duets with his favourite bassist. This performance is a masterclass on all levels. Track List: Adios Dolor; How Deep is the Ocean; Alma Hermosa; Landini’s Waltz; Amantes para Sempre; Anónimo Veneziano; Triangle Waltz; Thirdland; Two Hearts in One; Adios Isla; El Choclo.